Making homemade flavorful broth doesn’t get any easier than using a pressure cooker. There's no need to carefully watch a pot on the stove when a pressure cooker does all the work for you in a fraction of the time. This recipe gives a fast and easy execution that traps all the goodness in your finished stock. Measure and save the finished stock in frequently used amounts. That way you can easily grab 1 cup, 2 cups, etc.. and they are ready to go for just about any recipe! Put chicken wings, carrots, onion, celery, garlic, rosemary, thyme, parsley, peppercorns, and bay leaves in your pressure cooker; add enough water to fill to just below the maximum-fill line of the insert. Lock pressure cooker lid in place and set steam vent handle to Sealing. Select Pressure Cook (manual) and cook on High Pressure for 30 minutes. Turn steam vent handle to Venting to quick-release pressure. Drain broth through a colander and discard solids. Cool broth completely before portioning into sealable containers; use or freeze within 3 days. You can use this same technique to make bone broth; just substitute beef marrow for chicken wings. When draining the broth, be sure to use a fine-mesh colander to separate the solids from the chicken broth. Per Serving: 81 calories; 5g fat; 2.1g carbohydrates; 7g protein; 40mg cholesterol; 37mg sodium. In theory, I like making my own stock. In practice, I was always frustrated by how long it took and not feeling like I was getting so much for the time and effort. Using the pressure cooker did save me some time, which I appreciate greatly. You get all the flavor without dealing with reducing and then balancing by adding water to maintain some volume. Never going back. NEVER! This is great recipe for people who don't want to pull out a can every time a recipe calls for Chicken Broth. I haven't made my own stock before I bought my Multipot, but tried this because it's a very easy recipe. Next time I will save this recipe and freeze for later, yum! I'm always saying I am going to make my own homemade broth and I finally did it! This recipe was very simple, easy, and flavorful. I like to freeze it and store it for later. I should have been doing this all along! 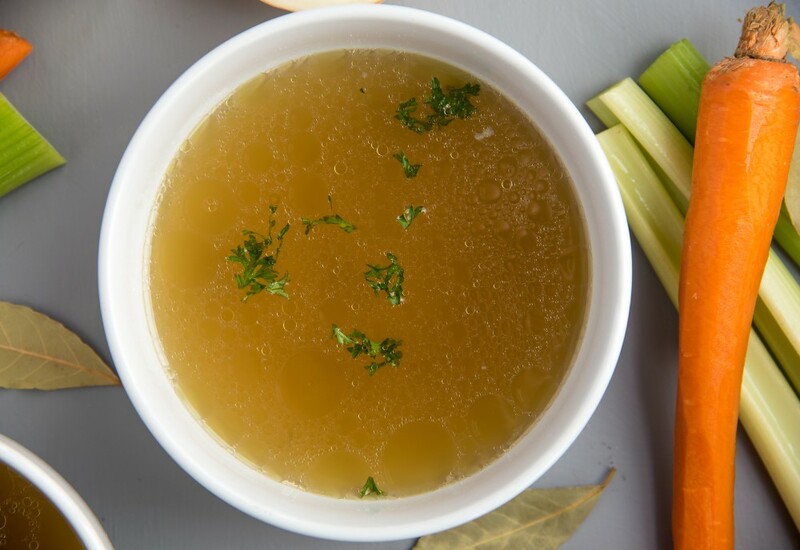 Homemade chicken stock is a must have! This is a solid, no fuss recipe. I use the broth for all sorts of things, you can never have too much of it! When my wife came home with two small $4 bottles of "bone broth," I knew I needed to find a recipe for this stuff and stat! I honestly cannot tell the difference between the fancy "artisan" bone broth and the stuff that comes in the cartons, but this is better than both of them because this craze has gone mad!